Did you know that many behavior problems and colic’s are caused by ulcers? Problems such as refusing jumps, kicking in the trailer, pinning their ears when you put your leg on while riding, biting or kicking when the girth is tightened, aggression towards other horses or humans, foal rejection and more. Also agitation or aggression at feeding time is a sign of ulcers, as they anticipate getting their food which dramatically increases the acid to flow causing pain. A horses stomach constantly secretes acid but when they are able to graze free-range they will then secrete saliva which buffers the stomach acid. Horses were designed to be free-ranging and spend about 60% of their time eating and 20% walking but most domesticated horses spend 15% of their time eating and 65% standing in stalls. Is is also thought that horses will get relief from ulcers by cribbing which encourages the behavior. Cribbing can also be learned by watching another horse too. From my research on the internet I’ve found that Veterinarians say that more than 50 percent of arena performance horses have ulcers of varying severity. Something I’ve done to help the stallions out that I have in pens was getting the slow feeder hay-nets as this mimics how a horse would graze, the openings are only 1.5” X 1.5”. Instead of throwing it on the ground where they gobble up the hay or they waste it by tromping it and defecating on it I put it in the hay-net and it keeps them going for a long time. I also have a slow feeder hay-net over my round bale which really helps with waste. I’ve been very fortunate over the years with my horses as I’ve only had one that I know of that had ulcers. When I found out he had ulcers I immediately started giving him a couple of products from Dynamite Marketing one was DynaPro and the other is “Miracle Clay” it worked wonders for healing the ulcers and is very inexpensive. If you want to learn more about “Miracle Clay” visit my Dynamite website. Watch the video below as you can do these tests at home on your horse to see if they show signs of having ulcers. 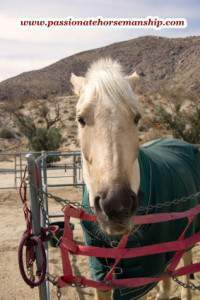 I have 20+ years of working with holistic products for horses, dogs and people. I invite you to sign up for my free report which will also subscribe you to my newsletter where I share different tips and techniques each week about clicker training, horse agility, show ring tips or how to use holistic products. These product statements have not been evaluated by the Food and Drug Administration. The information provided in these statements are not intended to diagnose, treat, cure or prevent any disease but rather as dietary supplements intended solely for nutritional support.